Taking an advance? Do you have to pay GST? 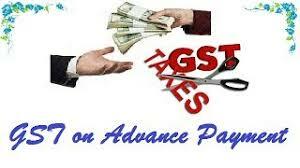 Recently, the GST on Advances has become of quite an importance. The government has made few changes regarding the applicability of GST on advances. Background: let’s start from the initial stage as it was stated in CGST Act. According to the act, every registered person was required to pay GST on the advance monies received. After few recommendations from various industries, the government came out with a solution. As per the notification no. 40/2017-Central Tax dated 13th October 2017, following person shall pay tax only at the time of issuing an invoice. ii) Whose aggregate turnover in the preceding financial year did not exceed 1.5 crore rupees or the aggregate turnover in the year in which such person has obtained registration is likely to be less than 1.5 crore rupees. It may be noted that this notification was only for the outward supply of goods and not for services. Later, on 15th November 2017, vide notification no. 66/2017- Central Tax, the government again changed the above-mentioned conditions for paying GST on an advance in case of outward supply of goods. This time they became generous for the supplier of goods as all the conditions mentioned above were waived off and a general waiver has been given from GST on advances to all the suppliers on the outward supply of goods. Though, the suppliers of services still need to pay GST on advances on the outward supply of their services. a) From 1st July 2017 until 12th October: All registered person supplying goods are liable to pay GST in advance received on goods. b) From 13th October 2017 until 14th November 2017: the Registered person who are not composition dealers and whose turnover for the preceding year or for current year does not exceed 1.5 crores rupees person shall pay tax only at the time of issuing an invoice. Others shall pay GST on advances, including service providers. c) From 15th November 2017 onwards: All registered person supplying goods shall pay tax only at the time of issuing an invoice. 2. For an Outward supply of services: The suppliers of services are liable to the payment of GST in advance received for services. There is no exemption for them.